Happy Thursday Junkies! 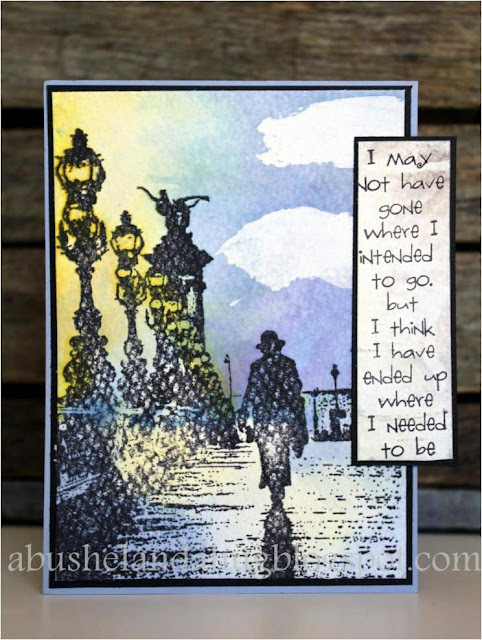 Jerri here today to share a card I made using one of the new August stamps just released. This is a really cool stamp called Pont Alexandre III. If you love this stamp as much as I do, you may want to jump on over and purchase it while it is still on SALE-15% off until August 8th! I wanted the watercolor look for this card. Here's how I made the card. I stamped the Pont Alexandre III on watercolor paper. I chose the smoother side, although you can still see some of the texture from the paper in the stamp, which I like. I used the Ranger Archival Ink Pad in black. You'll want to use an ink that is waterproof. To make the cloud like shapes in the top right corner, I used gesso. I just simply used my craft knife to make a couple of swipes on the top right of my card. I kept it pretty thin so it would dry quickly. I used some of my blue and purple stains to color the majority of the card front. I put some of the color on my craft sheet and then sprayed my card pretty well with water. Using a paint brush, I dabbed the blue and purple color on my card. Next, I did the same with yellow. I tried to keep the yellow around the lights and then I dabbed some along the street. I tried to make it appear as a reflection. To give the yellow a bit more PUNCH, I sprayed some yellow glimmer mist in the area next to the lights. I wanted it to be considerably brighter in that area. For the sentiment, I chose a Technique Junkies stamp called Needed to Be. I stamped it on a piece of scrap watercolor paper that I had applied gesso to. I also had hints of watercolor on it. The card front and the sentiment were both matted with coordinating paper. I hope you enjoyed my card project today. Don't forget to take advantage of the sale before it's over.